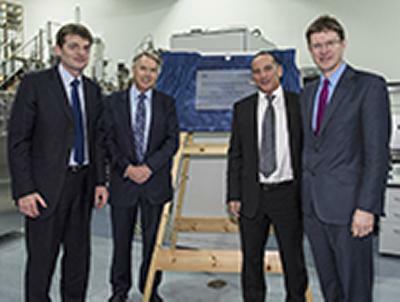 The Rt Hon Greg Clark MP, Minister of State for Universities, Science and Cities, officially opened the University of Southampton's state-of-the-art Advanced Composite Materials Facility yesterday (Thursday 20 November). The facility, which is unique to the UK, will aim to develop and manufacture radically new and advanced materials for semi-conductor electronics, data storage, photonics and energy harvesting, conversion and storage. Batteries haven’t changed in 40 years and the newly installed cluster manufacturing tool should result in a step change in the evolution of battery technology for consumer electronics and sensor markets, and potentially for larger format batteries for automotive and distributed energy storage applications. One of the first projects will be the development and manufacture of a new form of solid state battery in a close collaboration with Ilika Technologies, a spin-out company from the University. This involves the transfer back of experience gained at Ilika in the discovery, optimisation and synthesis of new materials. Universities, Science and Cities Minister, Greg Clark said: “The UK is already a world leader in advanced composite materials and today we took our capabilities to a new and exciting level. “From consumer electronics to space, these facilities will play an important role in transforming British research into world beating products. The University was awarded over £3 million by the EPSRC to develop the facility, which forms part of an £85 million investment as part of the government’s ‘eight great technologies’ to drive UK growth. Ilika are the key commercial partner in the laboratory, contributing over £500,000 towards establishing the new cluster tool and facility in which it is now housed. Ilika will be manufacturing its new solid state lithium ion batteries using the facility. The University has contributed £750,000 in refurbishing the laboratories. 1. The materials discovery methods which came from research at the university (funded by JIFF in ca. 2002) had such commercial implications that the IP generated was used to spin out Ilika Technologies in 2004. The company applies the methodologies developed and patented at the University to develop materials for major multinationals in the ENERGY and ELECTRONICS SECTORS, and also develop its own materials IP for solid state batteries and fuel cells. A continuing relationship between Ilika and the University has continued ever since, supporting state of the art research in materials. In 2010 Ilika floated on AIM, London. Professor Brian Hayden’s group comprises of two Post-Doctoral Research Assistants and one technician and seven PhD students working in the laboratory. There is at present five Ilika staff (postdoctoral level) also working in the laboratory. There are four other co-investigators on this project from other Faculties, all of whom will be employing two to three Post-Doctoral Research Assistants and PhD students in the laboratory starting in 2015.